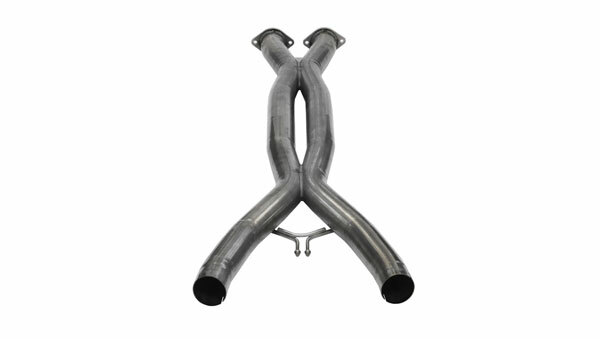 Corsa Performance 14761 - Corsa Corvette C7 / C7 Z06 Double Helixx X-Pipe 3 Inch 6.2L; 2014-2019. CORSA&apos;s new Corvette C7 exhaust from LMPerformance Fits NPP and Non-NPP Valve-back muffler systems and attaches behind the factory GM valves. CORSA RSC XTREME systems are Corsa&apos;s newest systems which are the loudest most aggressive systems Corsa offers. XTREME systems feature a deep growl at idle, bold during acceleration, and screams at high RPMs and still no drone at Cruise. CORSA RSC SPORT exhaust system is Corsa&apos;s Mid-Level Sounding exhaust and is best described as producing a bolder sound most evident between 3000 – 5000 RPM WOT. Corsa Sport Exhausts are characterized by High performance sound a distinct rumble at idle and aggressive sound through the gears but still no drone during cruising. CORSA RSC TOURING exhaust system is Corsa&apos;s Quietest System and responds with a more reserved, deep, V-8 sound, yet throaty under acceleration. The Touring Exhaust is characterized with a slightly louder then stock exhaust tone, quiet at idle and no droning at cruise. Please note there are 4 different sound levels available. Touring, Sport, Extreme and non-designated default systems where there is only one sound level. Xtreme - their loudest offering for those who want the loudest badest sounding system out their with an aggressive tone, CORSA&apos;s Sport systems for their mid sound level is a great alternative for customers who want an aggressive sounding unique exhaust but who do not necessarily want to hear it all the time. The sport option is a good option for mildly modified vehicles and for comfortable highway cruising, CORSA&apos;s Touring exhaust is their quietest system for those with highly modified engines or those who wish to only have a slightly louder tone then stock. If there is no designation on sound level (DB etc..) in the part name then the sound level is somewhere between a Sport and a Touring system.